Behold, a big double oven capable of cooking multiple items at different temperatures. 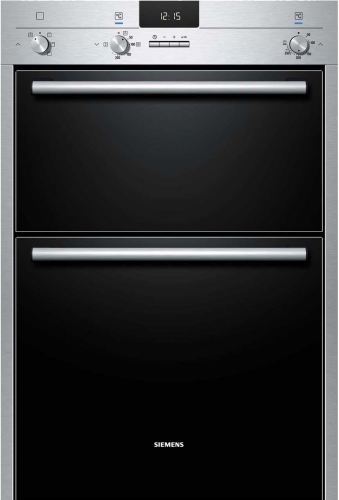 The HB13MB521B Stainless Steel Double Oven features a number of functions designed to increase your quality of life in the kitchen environment. First of all let’s begin with the basics. Here we have a fully customisable timer with auto-off capabilities; simple stuff but it’s good to know this is available. The main oven gives us 5 shelf positions and offers Siemens’ Hot Air technology, speeding up cooking time considerably. The secondary oven does lack this hot air mode, but makes up for it with 3 cooking options including a grill. Want to cook a sweet item alongside a savoury dish? With 3D Hot Air technology this is made possible! Heat is channelled intelligently as to not mix flavours and scents between shelves. Very clever stuff. All with with an EU Energy Label of A, which is particularly great for those of us who care about planet Earth and the sustainable nature of modern kitchen appliances. This is aided by the addition of heat reflective glass, which keeps heat inside where it belongs. High efficiency means lower electricity bills, and a lower carbon footprint. Every is happy! Oh, and patented ecoClean® material on the back liner means cleaning is a breeze too. Less chemicals, less scrubbing, less pain and aggravation. Finally, three optional telescopic rails are available under the Siemens number of HZ338357. This isn’t a necessary add-on but one we highly recommend if you’re the kind of person who is prone to burning yourself on the oven sides!